VISITING CHAR DHHAM THE FOUR PEDESTALS OF DIVINITY Nestling in the lofty peaks of the Himalayas are the four most revered holy pilgrimages of India. Yamonotri, Gangotri, Sri Kedarnath, Sri Badrinath, these four sites are collectively referred to as Char Dham. Four centuries pilgrims have set foot in these mystical vales in search in search of divine enlightenment. The Char Dham Yatra must be visited left to right beginning with Yamonotri, going to Gangotri, Then Kedarnath and culminating the journey at Badrinath. The route follows the Hindu tradition of parikrama or clockwise circumambulation. One has to traverse through the rugged and perilous terrains where uncertainty and danger awaits you at every corner. 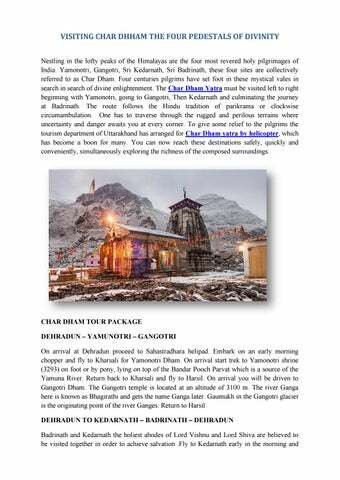 To give some relief to the pilgrims the tourism department of Uttarakhand has arranged for Char Dham yatra by helicopter, which has become a boon for many. You can now reach these destinations safely, quickly and conveniently, simultaneously exploring the richness of the composed surroundings. visit the temple and the Mana village. Worship the Jyotirlinga and witness the Rudra abhishek of Lord Shiva. Next day fly to Badrinath. The holy temple of Lord Vishnu, known as Lord Badri here, is one of the divine 108 divya desams. Later you can go for sightseeing to Mana village. The highlight of this yatra is the Maha Abhishek Puja which commences 4 AM sharp in the morning. The helicopter ride to Badrinath and back is captivating. Helicopter carries 5 people at a time to Char Dham, overloading is not allowed, suitcases cannot be accommodated, only handbags allowed. Children over 2 years and senior citizens are to pay for full tickets You are to carry your passport copy with a validity of 6 months. As the temples are located in high altitude areas passengers should carry enough woollen clothes and their medical kits.